QUESTION : PRINTING SLOWLY & PATIENTLY VIA LETTERPRESS, what can Lead Graffiti do to take the road less traveled? LEAD GRAFFITI TRIES TO AVOID REPEATING THE WORK OF OTHERS by experimenting with printing techniques, types of projects, and just looking around. We like to experiment with the normal pathways, probe new ones, combine and morph. We learn new visual vocabulary from those we collaborate with, and we seek to pass our craft on to others. Here are a dozen examples that bear witness to Lead Graffiti’s commitment to printing slowly and patiently via letterpress while striving for creative experimentation, spontaneity, and collaborative experiences. QUESTION : Does making each book in an edition different from its sibling copies offer any creative advantages? ELECTRIC FIRE FROM THE CLOUDS makes use of “ink pulls,” a by-product of our printing clean up process. The liquid effects are as beautiful as they are unusual, especially when executed on a substantial paper stock instead of inconsequential newsprint. And with the text reacting to the variations on each page, the collector of each book becomes an additional collaborator as they choose from the actual ink pulls to be used in the final assembly of their particular volume. QUESTION : How can we connect a reader to the ownership or humanity behind an object? THE MULTIFACETED MR. MORRIS is a book made up of the labels from an exhibition of Victorian books, photographs, drawings, and letters from the Mark Samuels Lasner Collection. Lead Graffiti wanted to humanize the selections with a sense of the “collector experience.” Highlighting each piece with a “visual nugget” that accompanies the item’s text helps connect the reader with a “memory” from the piece when they are examining it first hand. QUESTION : What happens if we connect our love for the endurance feat of the Tour de France to our passion for spontaneous printing via letterpress? 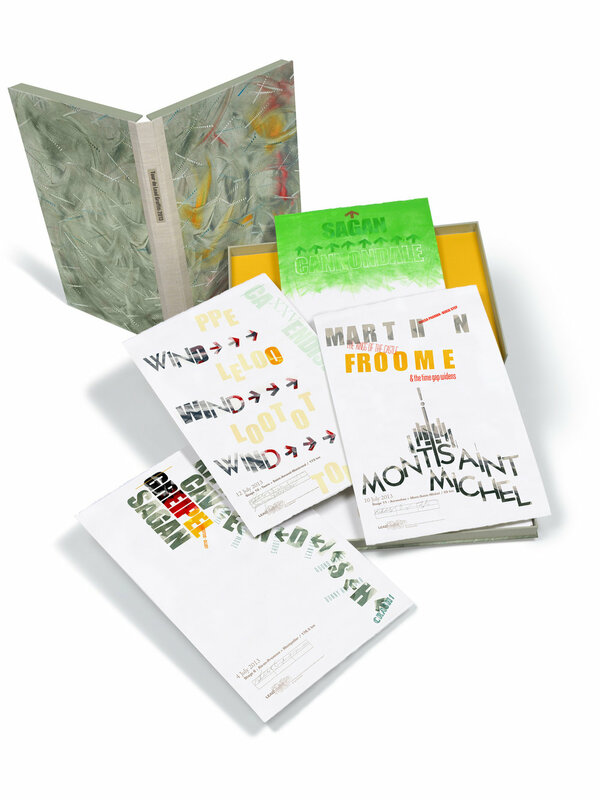 FROM 2011 TO 2015, LEAD GRAFFITI AND A SMALL ARMY OF COLLABORATORS watched each stage of the Tour de France, translating the happenings and cycling personalities into a daily journal of 115 broadsides. After watching the stage live on TV, we adjourned to our letterpress lab to work entirely with handset wood & metal type, and a variety of objects on hand such as bicycle chains, rubber bands, gauze, checkers, and more. The resulting 5 clamshell sets are an encyclopedic treasure trove of typographic imagery, hand-setting, and inking techniques. QUESTION : How can Lead Graffiti make a mundane type specimen sheet feel joyous? ALPHABETACHAOS No.1 is a hand-rolled specimen sheet of a 40-line alphabet of antique wood type printed via letterpress in 3 runs. Maintaining a delicate balance between readability and abstraction has always been a compelling tightrope to walk. 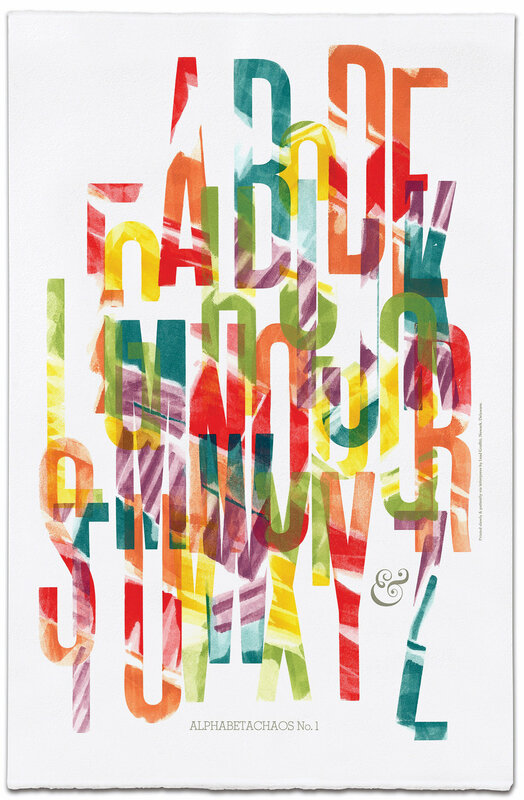 The energy and excitement generated in setting and inking the type are evident in the finished print. QUESTION : If we’re going to impress the unimpressible, should we choose “smart” or “hard”? THE ART DIRECTORS CLUB OF NEW YORK SELECTED RAY as one of their initial 5 Grandmasters educators. One of his students, Liz, designed the certificate. The studio of another graduate, Craig, took the photo. A London calligrapher friend, Satwinder, did the calligraphy. The ADC knew Ray was a letterpress printer so they asked if he would be interested in printing it. 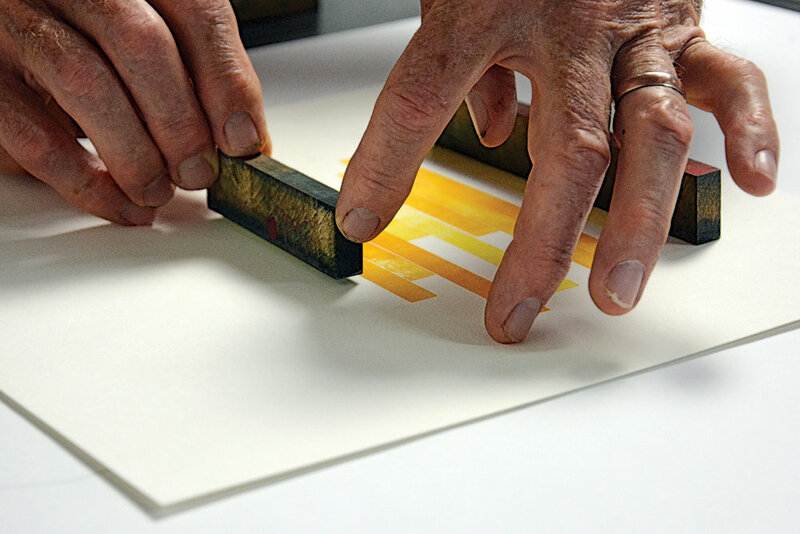 If you understand the character of letterpress and what that image for the certificate was, you would typically avoid the letterpress process. But for the Art Directors Club of New York, Lead Graffiti printed a full-color photo as posterized line art in 6 runs. QUESTION : How can Lead Graffiti get kids to be the architects of the milestones in their life? We’ve long been fans of the design for the Nobel Prize certificates (an international award given yearly for achievements in Physics, Chemistry, Medicine, Literature, Economics, and Peace) which includes a piece of original artwork along with the certificate produced entirely through calligraphy. While it has been a few years since either of us was in the 8th grade, it seems surprising how few names we can actually remember. We wanted to contribute to changing that for the Waldorf School of Philadelphia and, at the same time, celebrate this milestone as these students start their high school years. It needed to be special, both for the students, as well as for Lead Graffiti. And just maybe in the process, we could provide an Aha! moment for the students as they step between these stages of their lives. QUESTION : How do you get a lot of color without printing a lot of color? In today’s printing world there is always an interest in using recycled boxes from packaged goods. 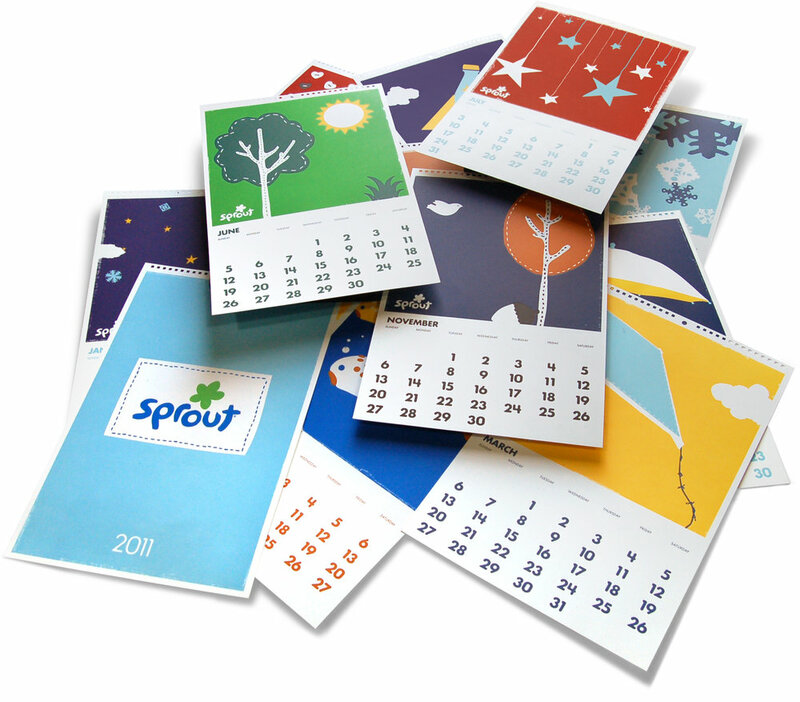 A 12-pack of soft drinks or the box from a package of cake mix offers 3 interesting reasons for printing greeting cards. Probably, should mention that these cards are great fun and pretty easy to print. 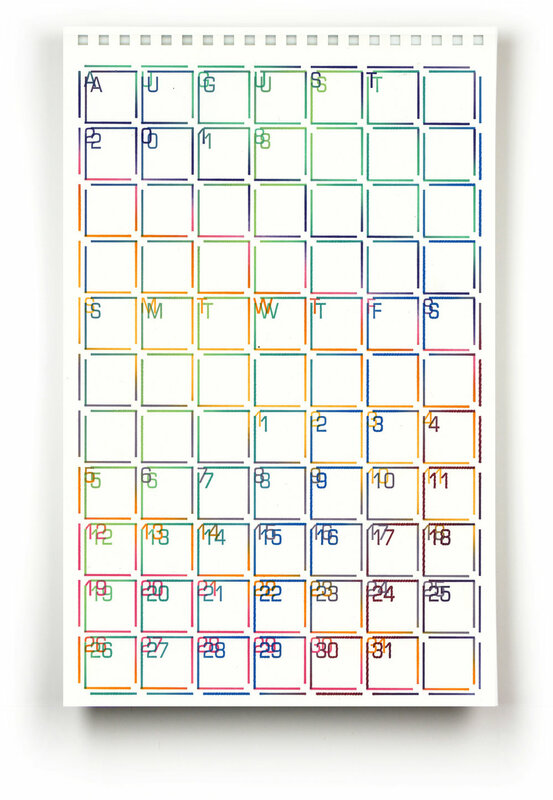 QUESTION : If letterpress printers intuitively figure out is is hard to print large areas of solid colors, how dumb do you have to be to print large areas of solid colors? 600 copies. 3 colors per page. 13 pages. We estimate about 29,000 impressions, which includes the fact that we needed to print a bunch extra to make sure we got 600 good sets of each. That was a stack of Mohawk Superfine 100#. We had to rent a small truck to deliver the job. When we got done, they paid us an extra $2,000 that we didn’t even ask for. Yeah for sometimes printing large solid colors. QUESTION : How loud can you print small? WE HAVE FALLEN IN LOVE WITH POSTCARDS. 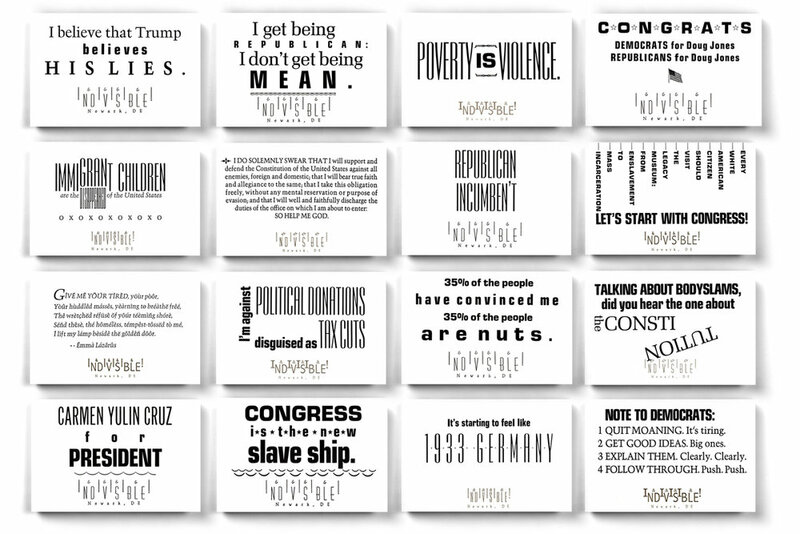 After the 2016 election, we wanted to put our love of letterpress to work as part of the resistance. A Rachel Maddow interview with EZRA LEVIN, one of the founders of INDIVISIBLE, inspired us. We decided to mail a constructive (sometimes more than others) letterpress postcard to every U.S. Senator, both Democrat and Republican, every 3 weeks for 15 months. We ended up sending 21 postcards. A few of them are shown above. QUESTION : How much work can you make almost no work look? Here’s one way. Start with a sheet that is 14” square. Cut one corner off at 30°. Line up your plate perpendicular with that corner. Set you press to print a rainbow roll. Print your 1st run. Cut the adjacent corner off at 60°. Line up your plate perpendicular with that corner and shifted about 1/4” over and down. Print your 2nd run. Trim your paper to the desired 7” x 11” shape. Done. QUESTION : How much letterpress experience can you cram into 14 students in a given day? 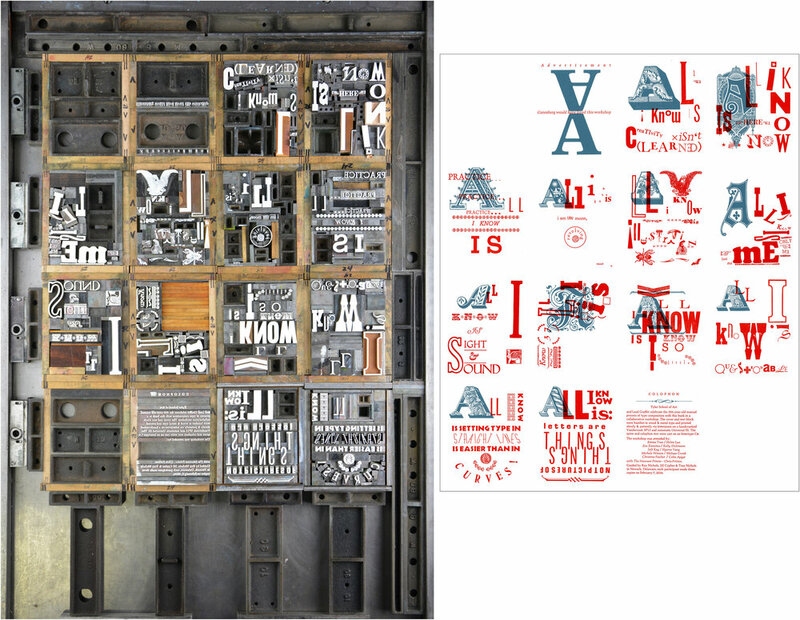 WE WOULD ARGUE THAT THIS IS THE BEST LETTERPRESS, BOOKMAKING WORKSHOP I EXISTENCE. For students, it's a little history, diving into a sketch-free form of creative thinking, a bit of writing, and typographic high jinks with a whole lot of hands on. For professionals, it's a different R & R : rerouting the way you think and refueling your creative engine. It’s a one-day portfolio piece. QUESTION : How can you get someone to forget that type is words and only think of it as shapes? Yeah, how do you do that? Well, it starts with a story about WWII & Nazi Germany.